In hospital for minor foot infection. Different IV 3 days. Off IV. 750 mg Levaquin one evening, another dose next morning. They gave me Levaquin information at discharge. Next day had swelling of ankle and knee, tendon pain back of lower leg. Stomach pain, loss of appetite, muscle weakness, feel awful. Over the next week ability to walk is diminshing. Pain developing in both knees, both hips and spreading to entire pelvic girdle, both wrists and left shoulder. ie weakness/pain of connective tissue of those joints. By three months have lost 10 pounds, mostly muscle and can not walk more than a couple steps without support. Muscle and connective tissue in pelvic area doesn't have enough strength to pick up and move leg without taking some of the weight off - hence using a walker. Muscle of legs, especially lower legs, burn especially at night and upon standing. Knees sometimes burn when lying in bed. I've been helped by continuous chiropractic care for keeping aligned especially pelvic area which was compromised by previous injury. Nutritional supplements support organ systems, kidney, liver especially detoxification, mitochondrial support, etc. , mitochondria. Homeopathic heavy metal removal. IV l-glutathione. I believe the most help has been from lymphatic drainage from a massage therapist using an electronic device. I am trained in the use of a cold red laser and that helps reduce pain. anemic condition contributed to weakness and shortness of breath. Thanks for sharing! Though I'm sorry to hear of your situation. Unfortunately you're a great example of how Levaquin Tendonitis can cause a body to quickly descend into a negative chain reaction. Sometimes it's a slow snowball. Sometimes it ALL hits at once (like the next day). And sometime it's a quickly growing snowball. And in cases of Levaquin cytotoxicity, there's nothing wrong with throwing EVERYTHING at it in hopes of giving your body a chance to recover. Have symptoms settled out now, or are they continuing to get worse? I'm curious of how much of each of those individual factors are you supplementing with? And what's your Vitamin D level? CLARIFICATION My 3 days of IV was not Levaquin. Only 2 - 750 mg of Levaquin. I believe I am not getting worse. Working on getting strength back. Blood lab result 2 weeks after Levaquin showed vitamin D3 at 59 ng/mL. I had been supplementing at least a year at 5000 IU. I worked (before Levaquin) for a holistic physician. All supplementation was from pharmaceutical grade companies and dosage was established by muscle response testing. Supplementation was mostly adequate compared to your checklist except for Carnitine, Lipoic acid, Melatonin and Coenzyme Q10. Working on taking more magnesium and vitamin C and a multiple. I'm not sure how to answer "how much of individual factors". Mitochondria support is a combination of lots of vitamins, minerals and other components. B12 levels tested out of range high in March. Am also doing a probiotic "enema" with a 16", intermittent catheter (soft). Two ounces of fluid with almost 300 Billion units of various strains at least once a week. IV l-glutathione started at 200 mg, twice a week and am now at 2400 mg, but only once last week. Thanks for all your hard work, research and willingness to personally help us. You're very welcome. I'm sorry you have to deal with this. That's good symptoms aren't getting worse. That's a good sign. Definitely more Magnesium, and CoQ10 (and keep that 5,000i.u. maintenance dose of Vit D). That's great you have access to IV glutathine. Might see if you can do IV mangesium too. I did make beef broth and was taking it. Unfortunately it caused my feet, ankles and lower legs to swell. I have stopped taking it, but the swelling is slow to leave. My blood type is A and the blood type diet does seem to be relevant. Beef is an avoid for type A. I guess I just proved it for me. On a more positive note, I got an earthing sheet. I've been on it over a week. I noticed right away that I was sleeping better. Pain level getting out of bed seems to have decreased a bit - the 8/9 doesn't last as long in the morning. I can't begin to imagine that the bone broth causes you to swell. If it did, I'm curious what's going on in your body, because something would be significantly out of whack. Unless swelling is a common occurance for you when eating beef? Who knows. As you know, the body is complex. It does make me curious though. Try some bone broth made from organic pastured chicken and let me know your experience. I'm a big fan of electrical therapies, as we're all electric. That's good news re: the earthing sheet. Are you on the Levaquin Tendonitis Forum? 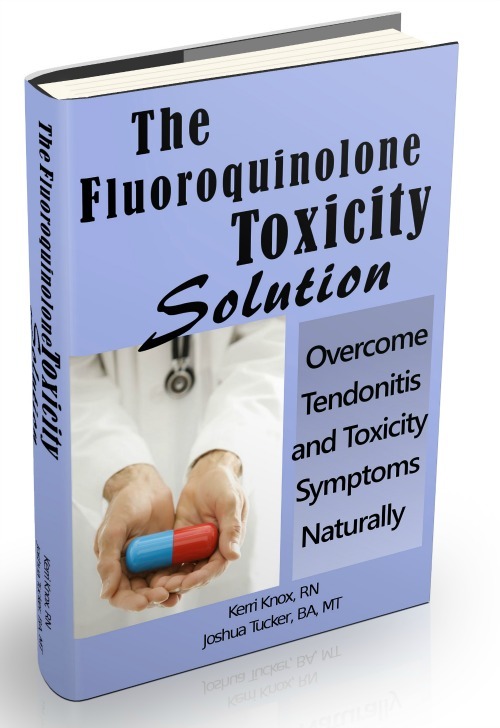 I saw some kind of link when I first got your Levaquin tendonitis ebook. When I clicked on it, it said my time had expired. Not physically able to keep up with everything. Can't find the link. Don't know how to get to the forums. Use the 'Contact' form on www.TendonitisExpert.com and give me your email, I'll send you an invite. Levaquin may affect soft tissue after 2-3 weeks of therapy. The risks of soft tissue damage are weighed against the dangers of the infection presented. Proper culture and sensitivity should be performed prior to receiving an antibiotic. I personally received Levaquin (750mg daily) for 10 days. I was bitten by a brown recluse spider which gave me a secondary infection of Serriatia. It cleared up the infection after previously having been on two other antibiotics. Don't be fooled by hype and voodoo. Trust your doctors and ask questions. Levaquin may affect tissue within hours of the first dose. The majority of antibiotic prescriptions are prescribed without any culture being done to verify bacterial infection or type of bacterial infection. I agree, hype and voodoo is to be avoided.